Novotel Benoa Bali is nested on the fringe of Nusa Dua Bali, beside the sandy golden Tanjung Benoa Beach, the southern peninsula of Bali. 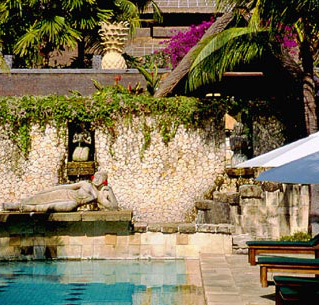 Novotel Resort Benoa Bali is only a twenty minute drive from Bali's international airport. A Bali's traditional fishing village is just one kilometer from the resort, where colorful ceremonies and rituals are a part of the daily life. The coconut wooden building structure and traditional thatched roofing combine to create. Daily programme of recreational activities cater to the energetic. For the holidaying families, the "Dolfi Club" is ready to welcome all kids (5 to 12). The Novotel Coralia Benoa Bali is just the place for those coming to Bali to look for the essence of the island, its people and how they live.